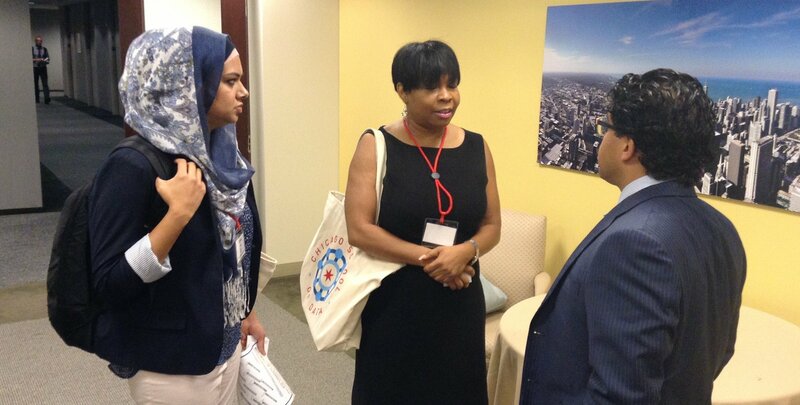 Samia Malik (left) compares notes with technologists at the Chicago School of Data conference. A Medicare database, second-hand stats and social-science findings shed light on how to handle data with care. Journalists look for reassurance in data, as a way to validate what their sources tell them. Scientists aren’t so sure – they joke about “data” being the plural of “anecdote.” Two sources are better than one, except when they’re both wrong. “You can really jump to the wrong conclusions if you don’t have an understanding of the background of the data,” says Matthew Roberts, informatics manager for Chicago’s health department. Researchers make a familiar complaint about their data: Getting quoted out of context. The issue’s playing out in a Medicare database of payments doctors took from medical suppliers. Both groups found errors in the data, and payments on research in progress were withheld. Before the site launched, Roberts told the Chicago School of Data conference that news media inspecting the raw data were among the first to jump to conclusions. “They just made some wrong guesses about what the data meant,” he said. The final Medicare database gives companies a chance to comment — to give details that could suggest a productive partnership rather than a conflict of interest.